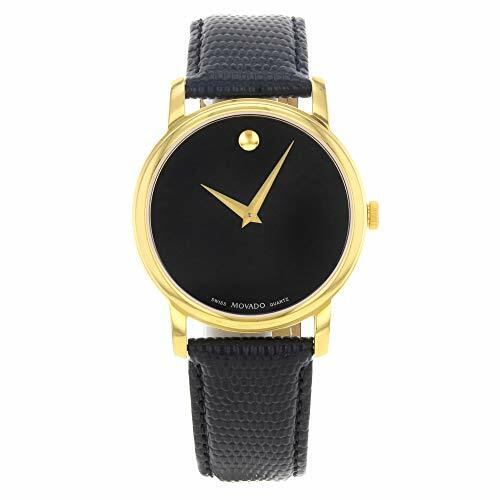 Movado have been making watches in Switzerland for over a century. However, the came to the world’s attention with the design of the Museum watch back in the 1940’s and have been creating bold and simple watches ever since. Today, Movado is part of a bigger watch conglomerate including MVNT, Concord and others. But we are here to talk about Movado and their stunning, yet affordable watches. All their watches have the stamp of Swiss Made, although the company is now American owned. They are heavily focused on the Museum style watch, with the large single dot at the 12 o’clock position. Some of their watches are very minimalistic, to the point of almost being impossible to accurately tell time with. But, they have also moved away from that to include more subtle hints of the Museum style and included other dress style watches as well. The thing I like about this brand is that they are an affordable, entry level (in most cases) Swiss Made brand that has a very striking style – so you get to wear something truly unique on your wrist. Not something that is the case with most watch brands. 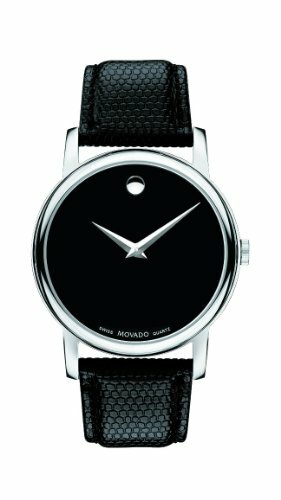 Movado is most famous for their Museum design, which you can unmistakably see here in this design. The single large dot a 12 o’clock is the only markings on the dial, aside from the branding at 6 o’clock. The Museum design was created back in the 40s by George Horwitt, and Movado have since started incorporating it into many watches in their collection. This particular model has a deep black dial, stainless steel case and a matching black leather straps. 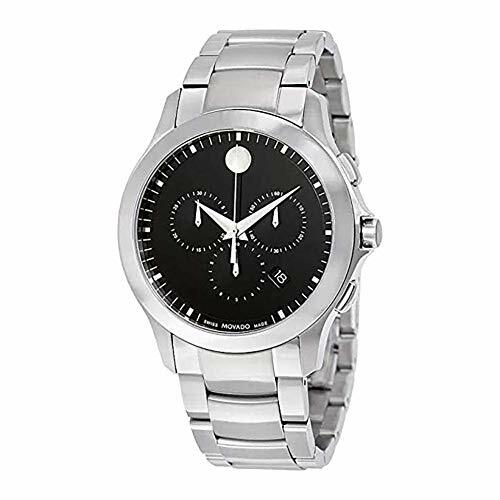 Movado watches bear the “Swiss Made” label, meaning the majority of the watch is Swiss – including the quartz movement. They have also added a stunningly clear sapphire crystal to the dial to help make this one of a kind design shine! Note: There is also a very similar model in gold with pig leather strap which you can also see here. Movado’s Museum collection is extensive and this bold metals model is another that showcases this truly unique design. The single color of the gun metal grey stainless steel makes this watch stand out from a crowd for sure. Ultra-modern, sleek and sporting the large single dot at 12 o’clock, this is a true minimalist’s watch. Unlike a lot of other Museum style watches, there is a helpful hour and minute marker track around the case edge too. The band is the same color and material, although the crystal is a bit below what I would expect with only a K1 Mineral and not sapphire. There is however the quality Swiss quartz movement inside. The Museum style continues, however now we are moving a little further away from the plain, markerless dial of the original. 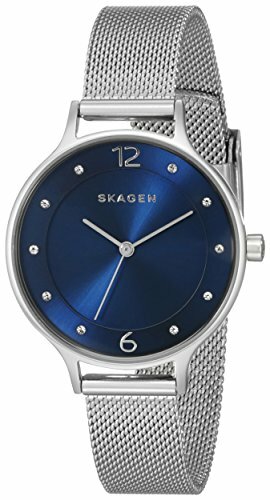 This models, like the one above, is a singular but striking blue, and has 3 sub-dials: weekday, hours and minutes. The seconds of the chronograph are taken care of by the second hand. 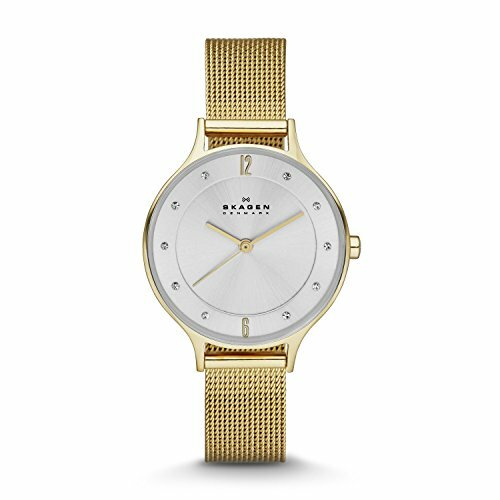 This model of the bold collection also features a stainless steel mesh strap, adding to Movado’s ever present modern and minimal feel. Another Museum chronograph, however this one is more true to the original in its simplicity. The large black case, black dial and gold sub-dial inserts scream style to me. I also love the spiral effect etched into the sunray at 12 o’clock. 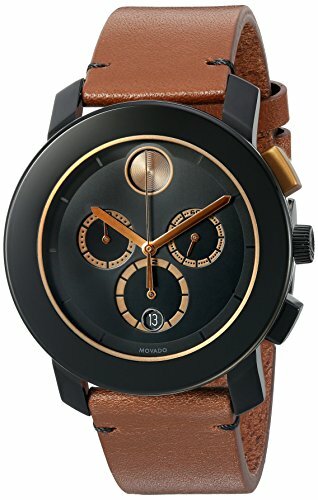 Movado are using the Museum style and taking it to new levels on all their watches it seems. This watch clearly comes with a 3 sub-dial chronograph and has a sneaky, almost blended date window at 6 o’clock, albeit with white font. I also love the attention to detail with the pushers in both black and gold, and the crown in black in the center. They have topped it all off with a chunky, rough, brown leather strap to bring it back down to earth. 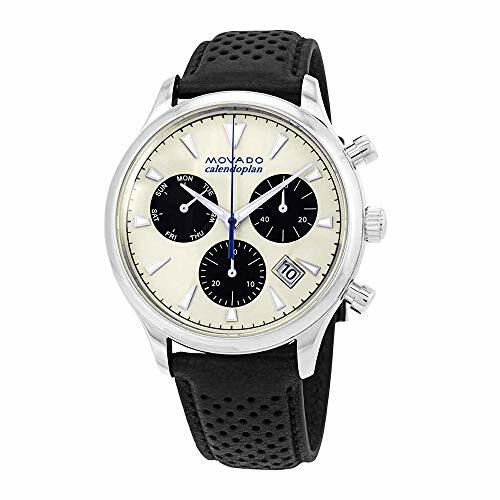 If you are looking for a more classic, dress style watch, this chronograph from Movado fits the bill. With it’s clean black dial, yes, sporting the museum dot at 12 o’clock, but also a subtly integrated 3 sub-dial chronograph. The hour and minute train around the case is also helpful, but still not obvious. The small size of this watch also makes it suitable for sliding under a shirt – with a 10mm height, and only 40mm diameter case. Overall, it is a simple, stainless steel model that everyone can wear to work, out on the town or around the house. Following on from the above dress style watch, this one is a little more “classic”. The plain white dial with triangular hour markers reminds me a little of the Seiko Cocktail Time, albeit with a different colored face. 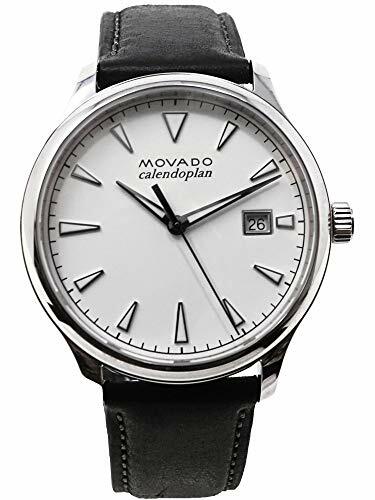 This watch is quite a deviation from the modern and striking designs that we are used to in the Movado Museum collection, but it certainly will suit anyone wanting something simpler and more standard dress style. Interestingly, it also comes with a sapphire crystal, which always adds a little extra class! 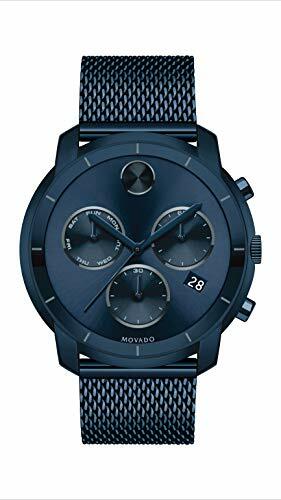 A combination of sports and dress, the Heritag Chronograph from Movado is the last watch I want to look at in this review. Like the dress style watch above, this one is also super-clean with n ivory dial, black sub-dials and a simple, rounded silver case. It stands out a little with it’s air hole black leather band though, and the old-school chrome pushers on the side. This watch will appeal to anyone who likes the TAG Heuer Monaco style of chronograph, albeit this one is round!